Building a mental model of the world … one day at a time. Now that I own property in Las Vegas, I’ve made week long stays there several times. While I’m not a full time resident, I think I’ve gotten enough of a feel to comment on what life on the Strip is like. 1. There’s always something happening. Chinese New Year celebrations and displays. Hot dog eating finals. A big fight night. Restaurant week. Vegas Uncorked. Huge trade shows. Concerts and visiting DJ’s. I often don’t find out about this stuff until *after* I’ve made plans to fly out, so it’s not like I’m planning to show up at the right times! There is always something neat going on. My point is … even if you’re a “local” and have seen all the permanent fixtures and displays of the Strip, new events pop up so often that you’ll never really see “everything”. The place moves faster than you do. 2. The city never sleeps. I’m a night owl, so I like the option of being able to get up and go grab a bite after midnight. There aren’t a lot of places you can do that, but in Las Vegas, it’s entirely doable. And walkable! 3. Normal life does not have to be vacation life. Most people have their vacations in Las Vegas as their frame of reference. They hear about living there and imagine their vacations and having to do that stuff every day. Shopping. Fancy restaurants. Clubbing. Walking all day and all night. Who could take that? Not me! Yes, it’s possible to do that. No, it’s not very balanced. It’s not what I do, and it’s probably not what you would do either. I go to Vegas and I play a video game, watch TV, or surf the web after doing work just like anyone else would do in their own homes. I might go see one nice show or eat at a nice restaurant just because I’m in Vegas for that week, but otherwise … no real pressure to do anything Vegas specific. 4. Traffic can be a doozy. Certain properties are worse than others to get in and out of than others. Some of the City Center properties only exit onto the strip, which is terrible for obvious reasons. Of course, a huge concert or event can also screw things up even more, which means you either need to be a patient person, or waste time being cognizant of when traffic is going to turn nasty. 5. Billions of dollars are being spent by tourists to improve your backyard. Imagine if you bought a home and someone offered to put in a million dollar garden display and rotate it every month. Well, that’s kind of what it feels like to own on the Strip. 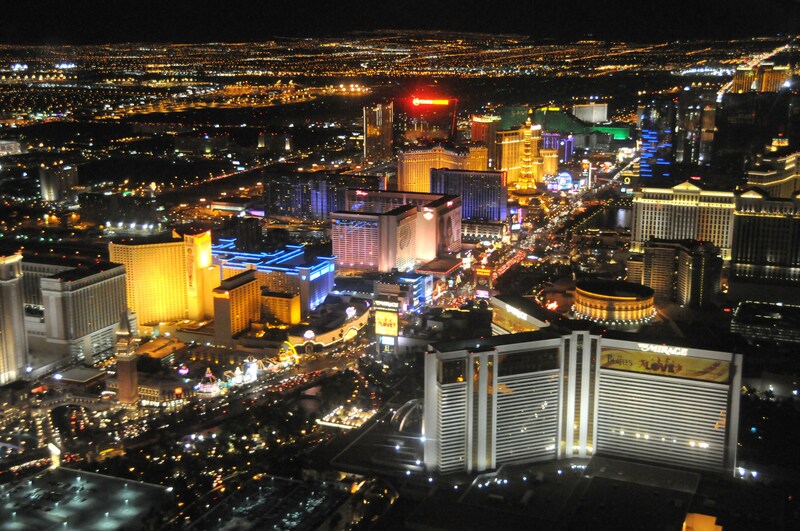 Las Vegas spends billions of dollars to attract tourists with new buildings, displays and amazing architecture. Technically, you don’t own it. But if you can just walk downstairs and enjoy it any time you want … well, is there really a difference? If you live in City Center, from the best Veer and Vdara units you have the Bellagio Fountains putting on a water show for you every 30 minutes. You can walk over to the Conservatory and take in the amazing floral displays any time you like. The ridiculous shopping is there for the high rollers … but you can just window shop too. Heck, if you can look at the amazing jewelry any time you want, why fork out money to buy the stuff! World class pastry chefs and cooks are just a short walk away if you want an amazing dessert or a meal. And on and on. At the MGM, the three star Michelin rated Joel Robuchon is a 5 minute walk away, along with a wide variety of top rated restaurants. They just opened the biggest nightclub in Vegas an extra 5 minute walk away. Sure, if you bought a house in the ‘burbs, you could have your own private pool. Or you could just go downstairs to Wet Republic, a 53,000 sqft massive pool party and hang out for free. See what I’m getting at? By living on the Strip, you’re getting some of that billionaire lifestyle for free just by virtue of the location. It’s an experience you really can’t duplicate anywhere else … well, unless you’re an actual billionaire. 6. The options are life enhancing. What I’m actually trying to say here is that it’s not so much the doing of everything that makes one happy. It’s just the idea of so many things being available, even if I’m not going to use 95% of them. Options equal freedom, and freedom and variety feels really great. 7. Grocery shopping and other errands need to be run off strip. OK, in a pinch, you can hit up a Walgreens or ABC for some sandwiches and snacks, or maybe order room service if you are living in one of the condo hotels. But there aren’t any real grocery stores where you can stock up within walking distance. Delivery is an option via Safeway/Vonn’s, so there’s that. But sometimes you just need to do your own shopping, like at Home Depot and Walmart. Yes, you’ll probably want a car if you live here. 8. For normal life, public transportation isn’t great. Speaking of cars … taking taxis off strip is too expensive for regular life, and public transportation isn’t well oriented for running off strip either. If you are being super cheap … it’s possible. But a bus ride to Walmart could take 40 minutes. And if you are being super cheap, what are you doing on the Strip again? So life isn’t as walkable as it might be in a normal and well planned city, unfortunately. It’s too bad they never got that anchor supermarket into City Center. That would have made a big difference. 9. People watching is awesome. There’s something very different about people watching in Las Vegas vs other towns. First of all, people watching isn’t that easy to do in most places to begin with. Things get quiet early. Here, you have critical mass well after midnight, both in terms of people to watch and good places to sit. Third, people are here to have a good time! The vibe is just a lot more relaxed and enjoyable. This isn’t the bustle of people trying to get to work or burn through a power lunch. Everyone is casually dressed during the day, and there’s a mix of casual vs dolled up folks at night. 10. Having friends come visit is easy … and fun. Of course, the very nature of Las Vegas means that all kinds of companies want you to get there as simply and easily and cheaply as possible. Why? So that you will spend your hard earned money. All roads (and flights) lead to Vegas! What this means is that many of your friends will be swinging through town just in the normal course of vacations, trade shows, etc. There is no better town to be in for randomly seeing old friends face to face. Of course, intentional visits are easier as well, if for no other reason than the frequency and service levels of flights. Oh, and if you’ve ever had friends over and wondered what you were going to have to plan to show them a good time, don’t worry. You’re in the easiest city in the world to figure that problem out! 11. Life can feel transient/temporary. Your home may feel like less of a home because of all the people who rent instead of buy. In a condo-hotel, that’s even more of the case because of the hotel part of the development. Some people want their homes to be a true retreat from the action and to be able to get to know the neighbors. Well, if you’re living on the Strip, you’ll have to take that as it comes. Your neighbors will be different every weekend in a condo hotel, and in a full-time residence, your neighboring units will probably be renters or just an empty pied-a-terre investment by an out of towner. Personally, this doesn’t bother me much as I live in a condo now, and I don’t really know all the people around me anyway. On the other hand, you start to notice the people that do actually live in the building. There’s a certain sense of camaraderie that arises as the real live-in owners start to recognize each other. So it cuts both ways. 12. It gets hot. Of course, we have to mention the weather. This is the desert, and it gets damn sunny out there in the summer. Bring the sunscreen and sunglasses. Learn how to cut through casinos and malls. Take taxis or the monorail when possible. Moisturize a lot, because it’s dry too. It’s manageable. In summary, living on the Strip is really quite a remarkable experience like no other. You might need to be flexible on the traffic, and if you hate people and the occasional interruptions to a constant routine, you probably wouldn’t like it. But the variety and ever-changing nature of the Strip is a wonderful thing that you mostly only need to partake of when you want to. I plan on enjoying it for as long as possible. I’ll conclude with a couple of other articles written about this topic. This entry was posted in Las Vegas, Lifestyle, Real Estate. Bookmark the permalink.